PHILADELPHIA — Hillary Clinton and her surrogates hope to make a powerful case for women voters here at the Democratic National Convention this week. There is an opportunity to do so. Morning Consult’s polling shows that women, so far, have proven more reluctant to support Donald Trump than men. In the weeks leading up to the Democratic and Republican national conventions, women were far less likely than men to say they supported Donald Trump. But there were also a lot more women who were undecided. Only about one-third (36 percent) of women surveyed in June and the first two weeks of July said they supported Trump, while 44 percent of men were Trump supporters. But 21 percent of women said they didn’t know or had no opinion about who should be the next president. Only 15 percent of men were undecided. If the 2016 presidential election were held today, for whom would you vote? This six-week Morning Consult poll includes responses from 23,347 registered voters, a robust sample that can, with larger confidence than an instant poll, identify the differences between various voting blocs. A smaller weekly Morning Consult national tracking poll, taken over the weekend after the Republican National Convention ended in Cleveland, showed that Trump gained women supporters as part of the traditional “convention bump” that shows a spike in polls for the candidate who has just been nominated. It is unclear if that level of support will remain after the Democratic convention has concluded. Independent women are stubbornly divided between Clinton, Trump, and undecided. Before the conventions began, 33 percent of independent women said they supported Clinton, 31 percent supported Trump, and 36 percent said they didn’t know or were undecided. In Morning Consult’s most recent poll, Trump gained among independent women, with 37 percent. But 34 percent are still undecided, and 30 percent are Clinton supporters. Both before and after the Republican convention, independent men are more likely to support Trump. The Republican nominee has 43 percent among independent men in both Morning Consult polls. In both polls, 30 percent of independent men say they support Clinton, and 27 percent are undecided. Before the political conventions began, the youngest women were most likely to support Clinton and least likely to support Trump, echoing Morning Consult’s earlier analysis showing that younger voters generally are more inclined toward Clinton. Almost twice as many women between the ages of 18 and 34 said they support Clinton (49 percent) as those who said they support Trump (26 percent). The youngest men also have been more likely to support Clinton (46 percent). About one-third of them (36 percent) said they are Trump supporters. That’s a much smaller support level for the real estate mogul than among men over 65, where 53 percent of them said they will cast their vote for Trump. Only 34 percent of men over 65 said they will vote for Clinton. Among both men and women, Clinton bests Trump with voters aged 44 and younger. Women between the age of 45 and 54 still go for Clinton over Trump, 42 percent to 38 percent. Men in the same age group are in the opposite direction. They choose Trump over Clinton handily, 48 percent to 38 percent. 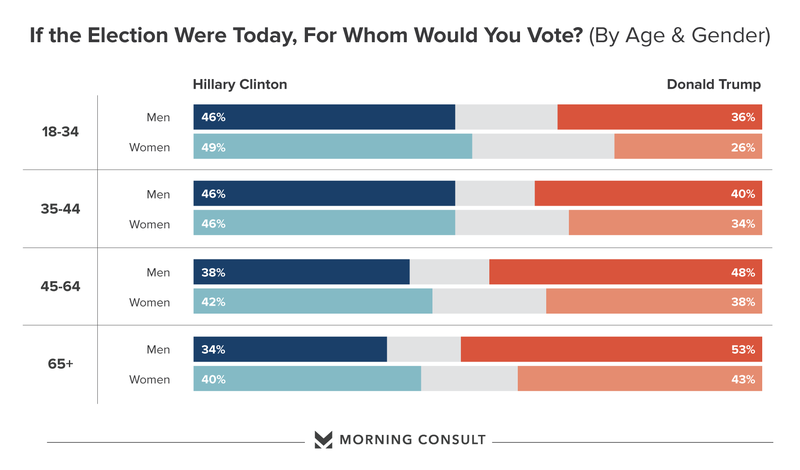 The oldest women are the only bloc in Morning Consult’s data to favor Trump over Clinton, 43 percent to 40 percent. Morning Consult’s most recent poll, with a much smaller sample size of 2,502, shows that 42 percent of women support Trump, a big jump if it holds. That’s still lower than the 47 percent of men who are Trump supporters, but it shows that the Trump campaign’s outreach to women (particularly from his daughter Ivanka Trump) may have worked. About the same proportion of women (18 percent) are still undecided, while 14 percent of men are undecided. When it comes to voters’ top issue, women (29 percent) were significantly less likely to select the economy than men (37 percent). But only 6 percent chose women’s issues as their top priority; 2 percent of men did so. Women and men were equally likely to say national security was their top concern, at 24 percent.